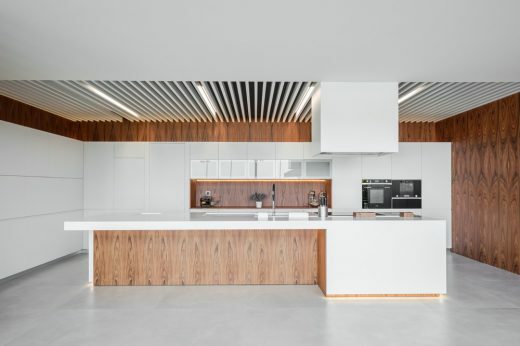 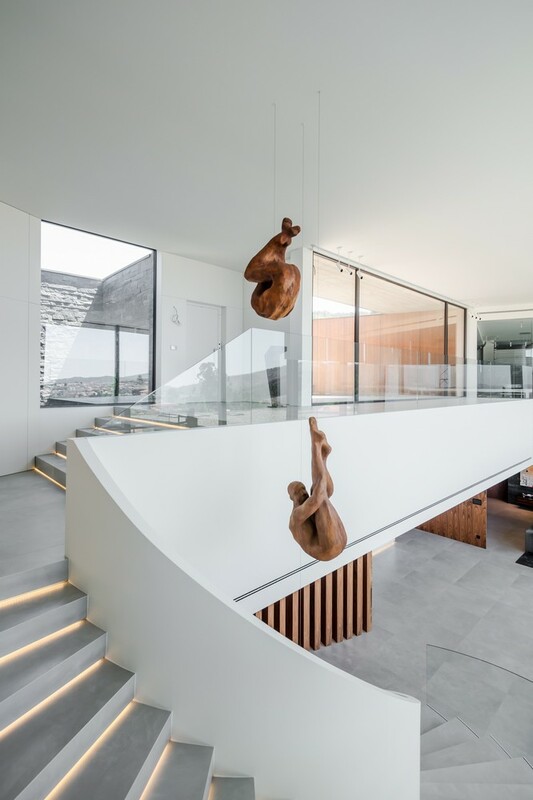 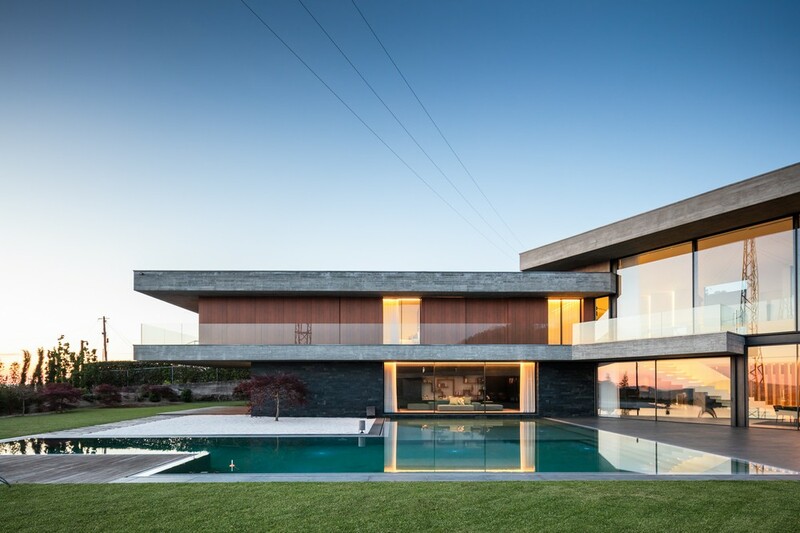 The Fraião house, located in Braga, is a project set up on two floors in a “V” shape, that was conceived to take advantage of the previledged views over the city. 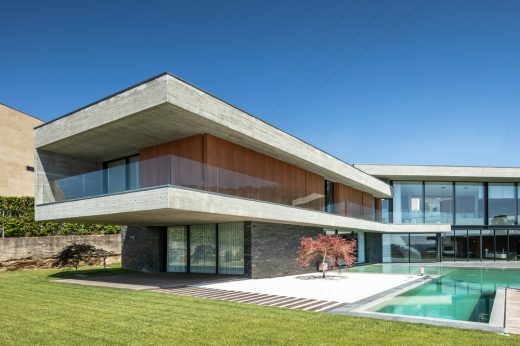 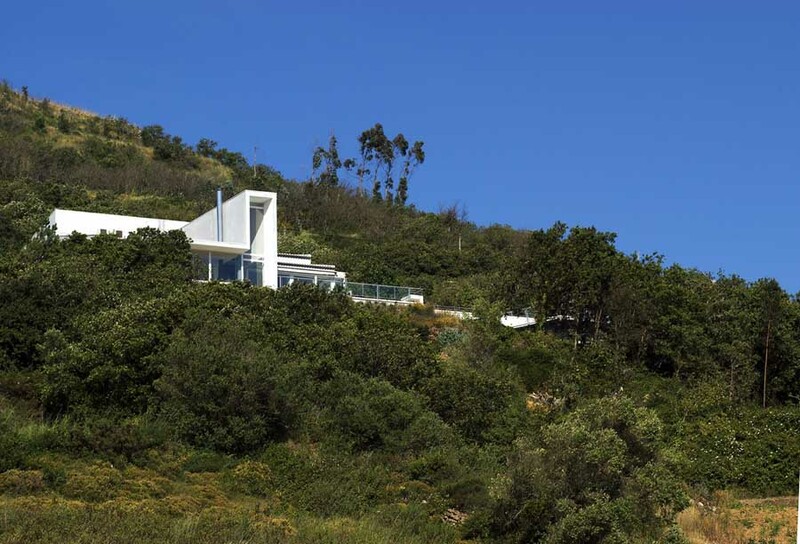 The house lies on a densely populated hillside with unique houses and an excellent sun exposure, providing an extraordinary glimpse into the landscape, composing a mesmerizing image. 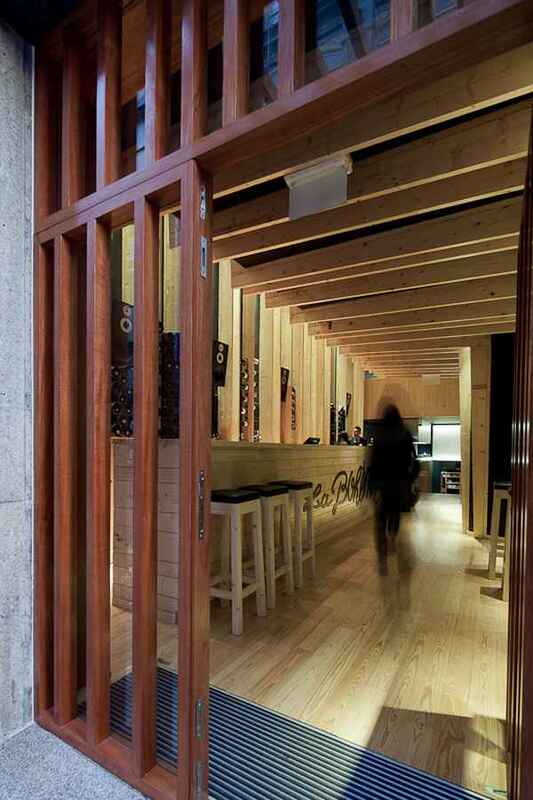 One of the key concerns was to create a fluid and permeable housing concept, without the loss of privacy. For that reason, it was developed a central body to host the social area, and two rows for the more private functions, creating a “V” shape with arms focusing the sights over the city. 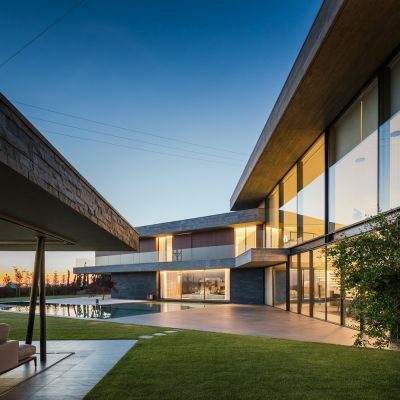 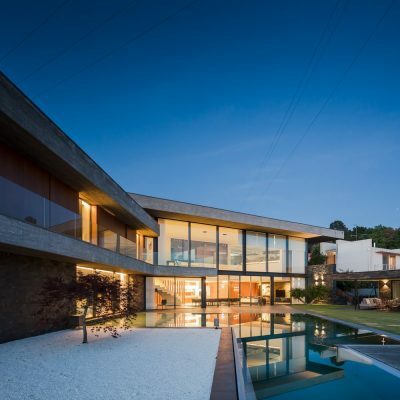 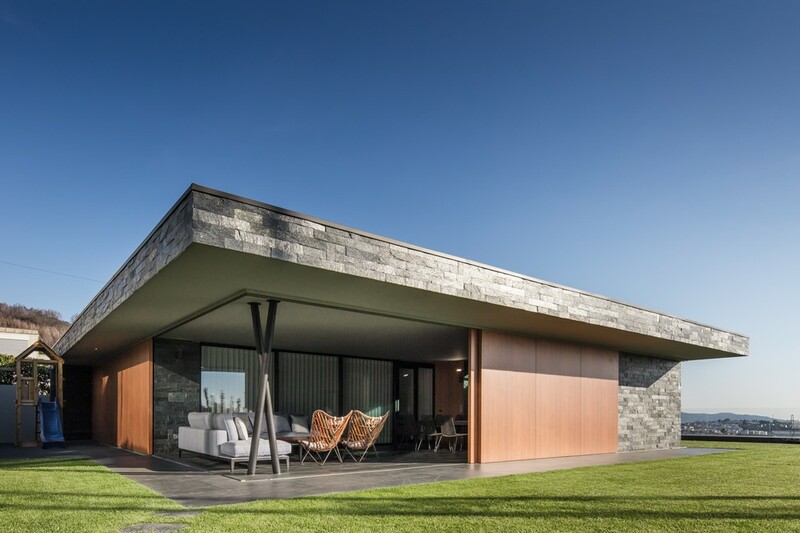 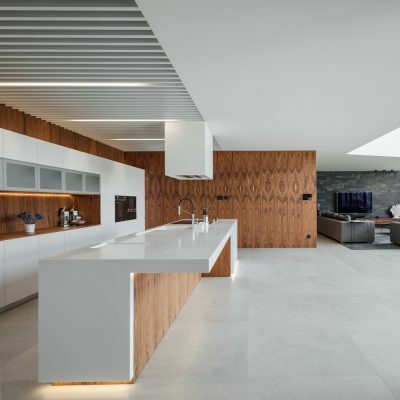 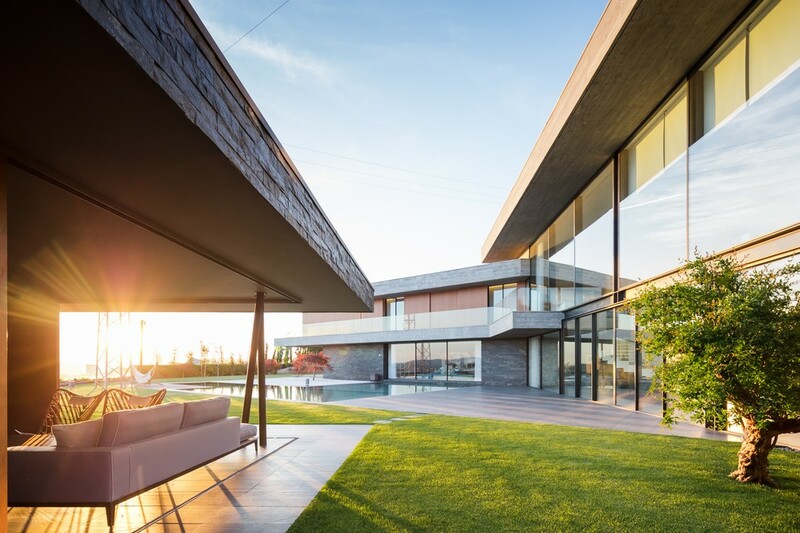 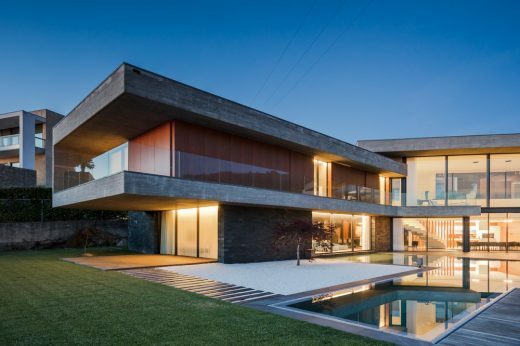 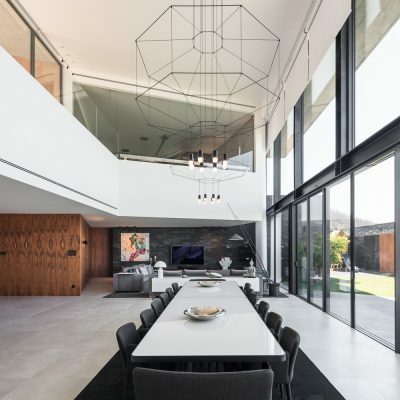 Due to the site’s slope, the house was develop to articulate an entry floor at street level with a lower floor, where the living room connects entirely with the garden and the swimming pool. 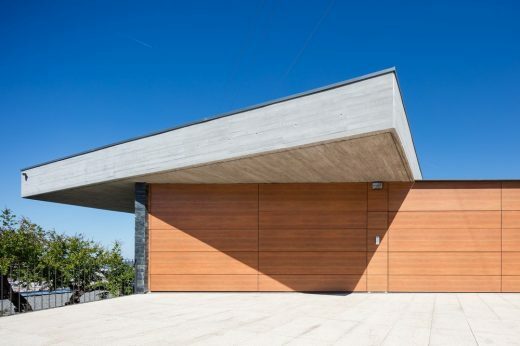 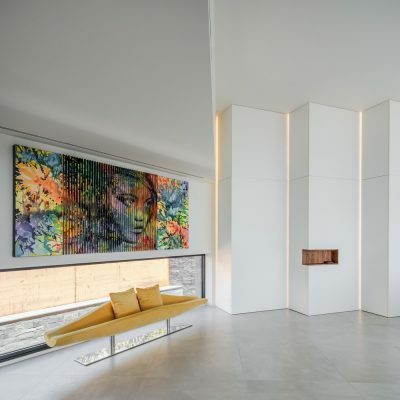 That has allowed to create a very discreet entrance with a fast access to the ground floor, without evidencing the 930.00 square meters that form the house. 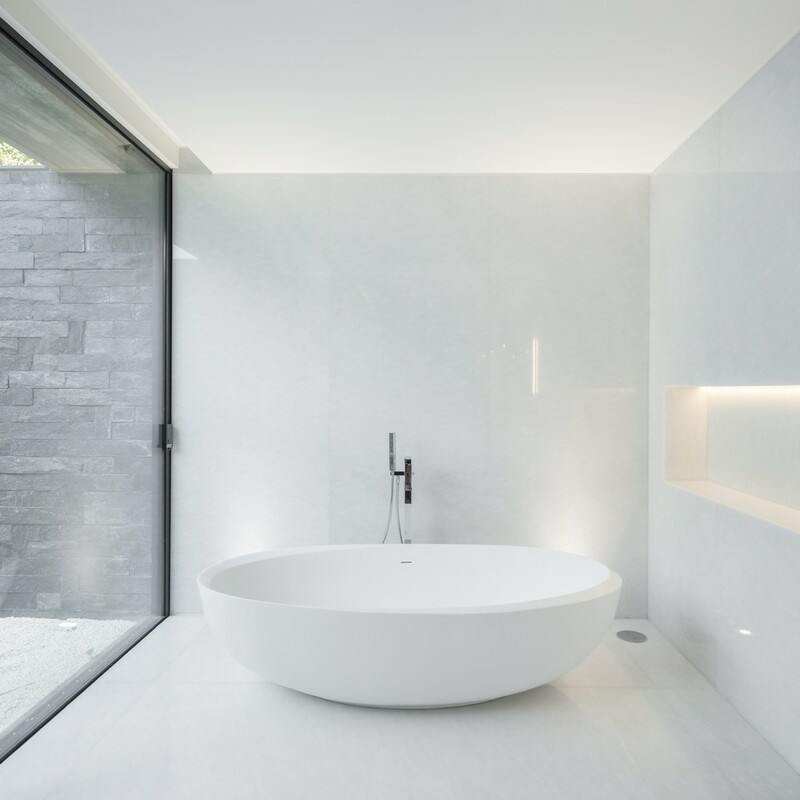 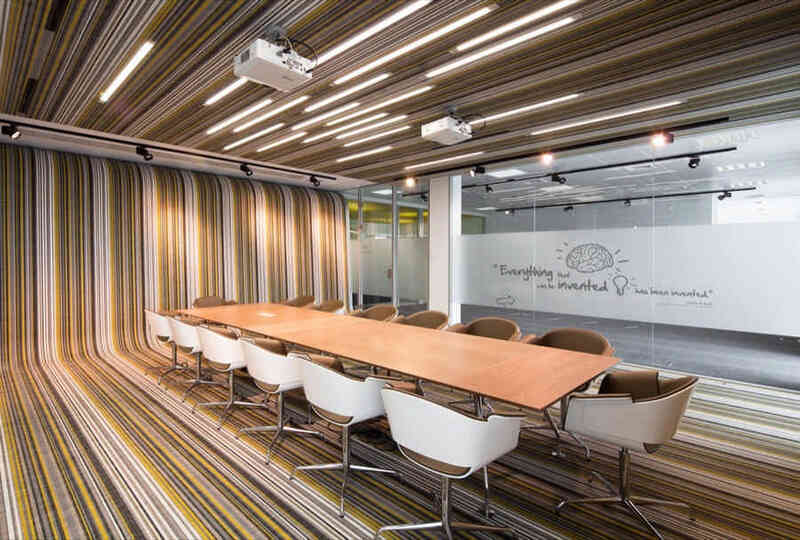 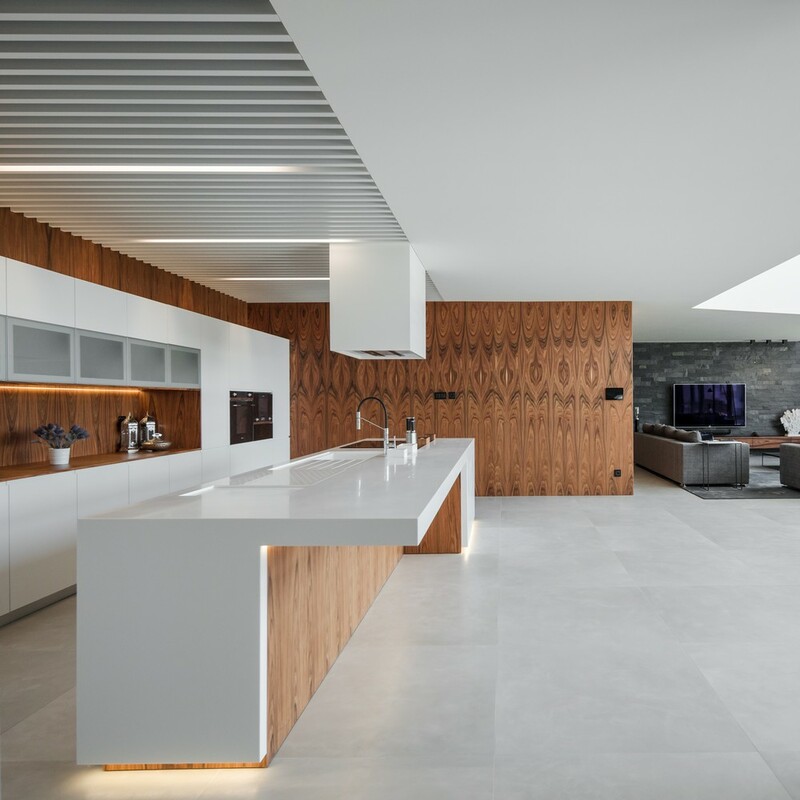 The main idea was to develop a project that can trigger emotions as the client walks through the house, providing in each moment new points of interest and comfort sensation. The main entrance is done through a porch, in which a large window, allows to take a glimps on the interior of the house, through the large double height area, displaying the living room in the lower floor and the view over the city. 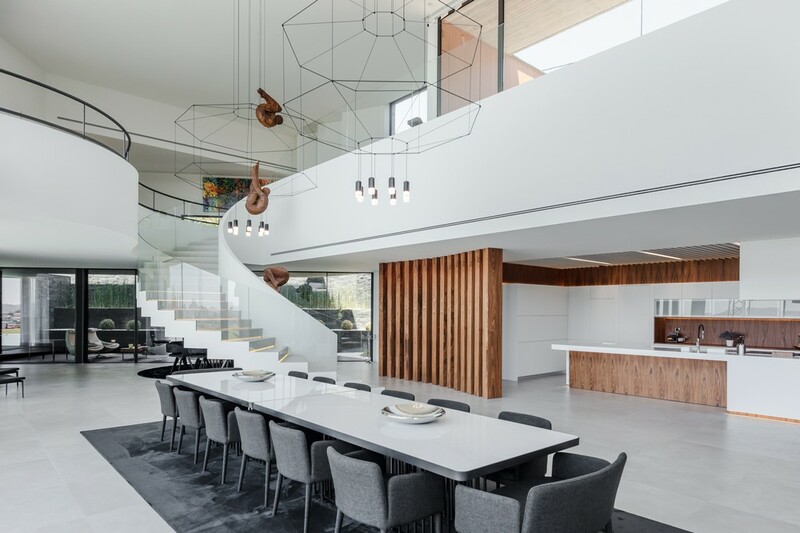 As soon as one enters the house, the double height area with glass facade provides a wonderful perception on the scale of the volume, marked by architectural details and decorative pieces with unique design. 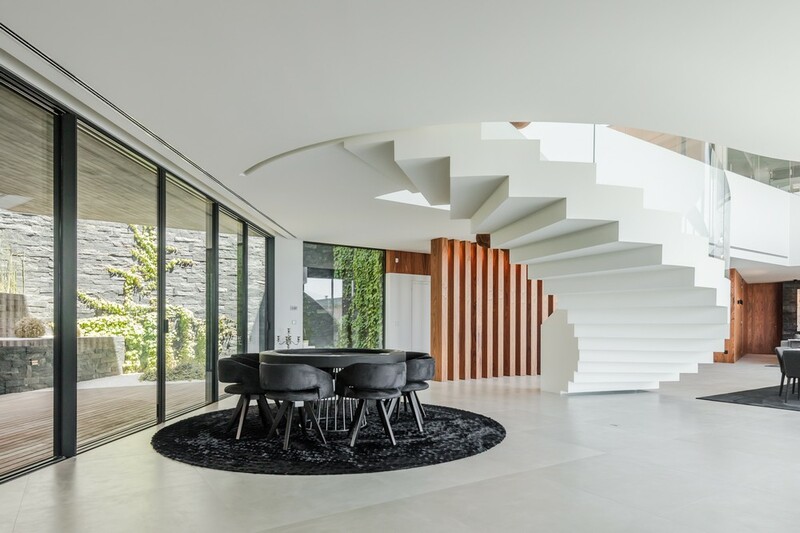 A scenic spiral staircase takes us into the ground floor, standing out in the vastness of the double height area. Cars are one of the client’s greastest passions, owning a vast private collection, that was considered an important feature to explore in the project. 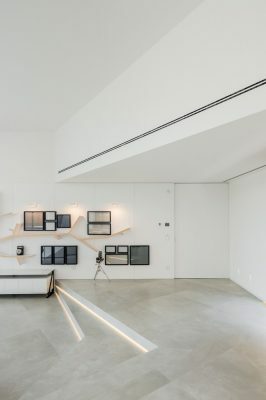 To host those vehicles, it was created a garage volume in the upper floor, that invades the social space. 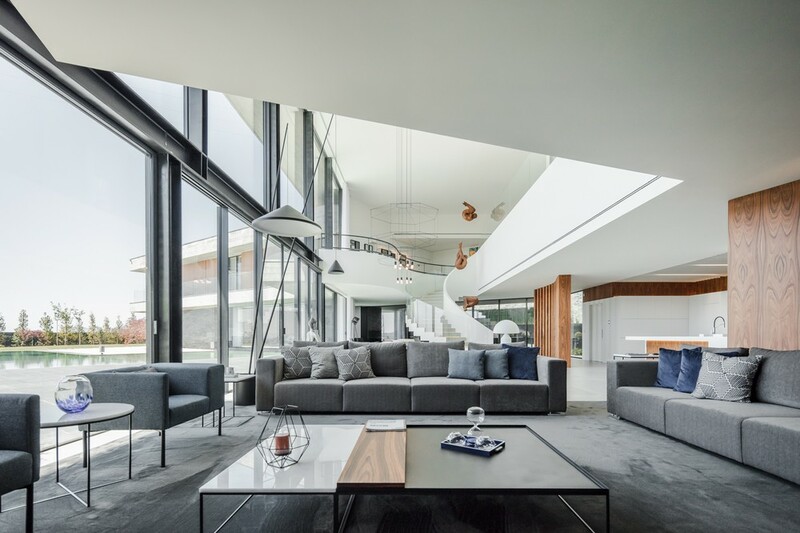 That volume, in see through glass, is visible from any part of the living room, providing a showcase to display that collection.